Case Presentation: A 64 year old male presented with a three day history of fever, hand soreness and rash. On the day of presentation, he had just returned from the Caribbean, however denied any history of ill contacts, recent hiking or contact with large bodies of water. There were no known allergies, recent changes in his usual medications or any personal or family history of autoimmune diseases. There was a known history of type 2 diabetes mellitus, hypertension, chronic kidney disease and hyperlipidemia, for which he adherent with his medications. On presentation, he was noted significantly to have a fever of 38.6⁰ C, periorbital swelling and a generalized erythematous morbilliform rash with areas of confluence affecting palms and soles while sparing the mucosa. Initial labs showed leukocytosis, thrombocytopenia and an elevated creatinine of 4mg/dL (baseline 2.6). His course was complicated with persistent fevers of 38.3⁰ to 39.4⁰C, eosinophilia (> 700 microL), hepatitis with conjugated hyperbilirubinemia, acute kidney injury, pneumonitis with bilateral pleural effusions and elevated lipase with pancreatic edema. Management was mostly supportive with continuation of his usual medications and a failed trial of doxycycline. 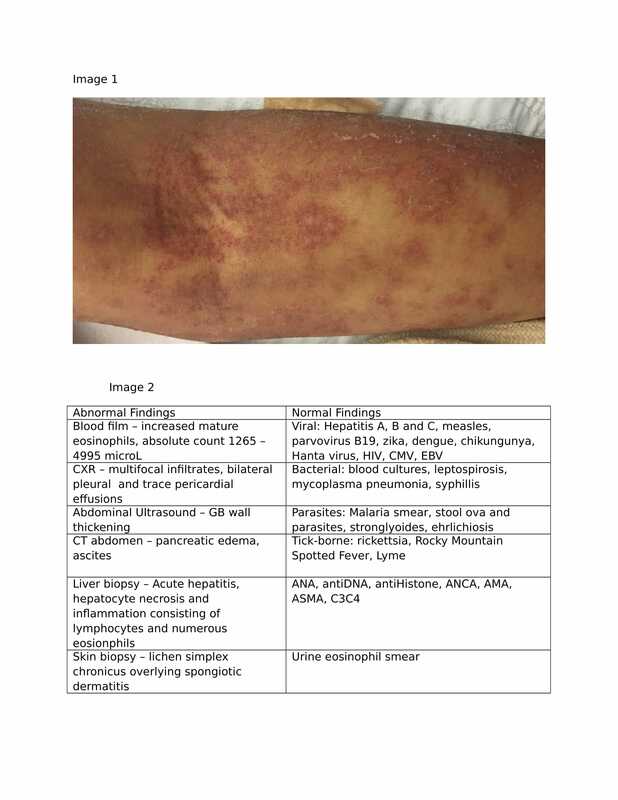 Discussion: After an extensive work-up for possible causes of eosinophilia, a diagnosis of Drug Reaction with Eosinophilia and System Symptoms, DRESS was confirmed with a Registry of Severe Cutaneous Adverse Reactions (RegiSCAR) score of 6. This is a rare, life threatening condition that has a latency period of 2 to 8 weeks after exposure to the offending drug e.g. antiepileptics. Its incidence is unknown and its association with HHV-6 reactivation has led to various pathogenetic hypotheses. With no history of the commonly reported drugs in this case, a literature review resulted in a documented case of Pregabalin drug hypersensitivity syndrome. Pregabalin was held and the patient subsequently had a cessation of his fevers, rash exfoliation, a return to his baseline creatinine and decrease in his liver enzymes. Conclusions: DRESS has an increased risk of mortality when associated with acute liver or multiorgan failure and increased morbidity, at times necessitating liver transplantation in acute liver failure. Due to the potential adverse outcomes, overall cost and the likelihood of under-reporting, clinicians must have a high clinical suspicion, as the mainstay of therapy is to remove the offending agent which is often a commonly used drug. This is a unique case of Pregabalin causing a life-threatening multiorgan illness that is likely underreported. Donaldson, SV;	Sulaj, DB	. ITCHY EOSINOPHILIA. Abstract published at Hospital Medicine 2017, May 1-4, 2017; Las Vegas, Nev. Abstract 425. Journal of Hospital Medicine. 2017; 12 (suppl 2). https://www.shmabstracts.com/abstract/itchy-eosinophilia-2/. Accessed April 22, 2019.